While visiting the clinic, our team here at the Laser Hair and Skin Centre would like to make your appointment as comforting as possible. With our and highly qualified laser technicians our goal with every client is to provide ease of mind before, during and after treatments. Each member of our staff has years of experience in order to deliver the safest and most efficient treatments to date; therefor leaving no room for concern for our past, present, or future clientele. We pride ourselves on going above and beyond the requirements to run a medical laser clinic. Laws and regulations are not properly put in place when it comes to standards in who can use the equipment to provide treatments, what sort of equipment is used, and where these treatments take place in Alberta and mostly every province in Canada. This opposed to the United States where more than half of the state’s governments stipulate that clinics must meet proper regulations and may not perform laser hair removal and skin treatments without the supervision of a medical personnel, regardless if they are trained in other similar cosmetic or esthetic areas. Our belief is to have our team trained at globally recognized leading institutes, therefore insuring the protection and well-being of our clients. Some claim to have ten years of experience, but what kind of ‘experience’ is that really? Is it experience in hair dressing and esthetics, dog grooming even, or just small skin treatments at a neighborhood spa? These questions need to be asked in order to get the real story. Any laser equipment can be extremely dangerous, especially if the person on the other side of the laser gun is not properly trained and certified with all of the precautions and professional knowledge needed to treat an individual properly, and safely. It may sound simple to set up a machine, but keep in mind every person’s skin is unique, and without training to notice even the smallest difference in skin type, the client is at risk for permanent damage. Most un-trained technicians set up the machine on a very low power, this is to be on the ‘safe side’, but to the client these treatments can be undesired and highly unlikely to be cost efficient. Machines also used in spa’s are known as “spa-grade” or “beauty-grade” equipment, they do not have the proper power output nor the effective wavelengths known to provide effective results, especially when compared to the only machines we at the Laser Hair and Skin Centre use, which is medical grade equipment. Any person trying to persuade a patient by saying the equipment is all the same is entirely inaccurate, and because of these statements we would like to recommend those considering laser hair and skin treatments to be extremely cautious while exploring different clinics and spa’s. This also is the reason that you will see prices vastly vary throughout the city. Often places are able to market their service cheaper, because they have inexpensive equipment that is unable to reach the accuracy of our machine’s results; and also because their technicians are not trained therefor they are paid minimum wage. Anyone can claim to have experience or claim to have the best equipment, but all it takes is a little research to filter out those who are safe and those who are hazards. In our establishment, the Laser Hair and Skin Centre has been providing proven results in Calgary for laser hair removal for over 15 years. 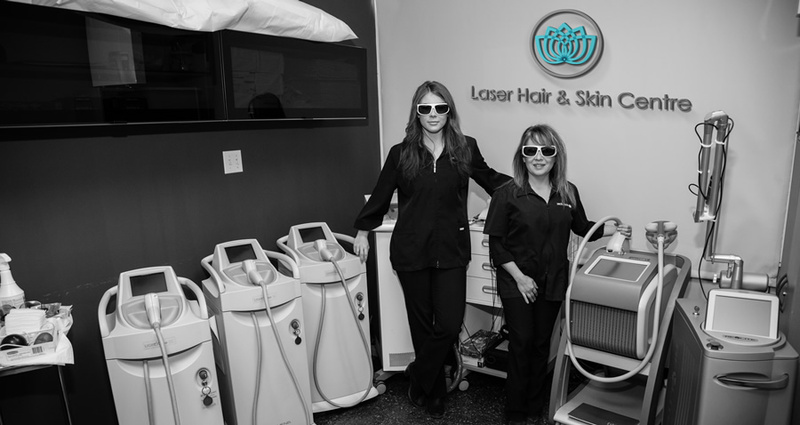 Our team is dedicated in always being on top of our industry, we are continuously researching the latest in technology in order to remain leaders in medical laser hair and skin treatments. Our success and large investment in our clientele is second to none. We have several medical grade gold standard machines (or Light Sheer) for laser hair removal treatments, so that when getting a large area treated (example being legs, back etc.) we can have two technicians and two machines at work to have you out and enjoying your day in half of the time. Very few places can offer this with medical grade gold standard equipment; but our dedication to our clients and their experience is what is most important to us.